After so many reviews or posts from my trip to England I thought I’d better finish my Andalucia series and since I just have a few more articles left today will be about food in Nerja. Now as you know from my Seville, Ronda , Granada or Cordoba experiences I am quite fond of Spanish tapas and really discovered some places that deserve a visit. Unfortunately this didn’t happened in Nerja also. Since I didn’t enjoy any of my meals I will try to keep this as short as possible because I still have a lot of good things to write about my latest trip in England plus the big article I’m preparing for my entire trip in Andalucia. Even though I only spent one day in Nerja I managed to test three places after searching for information on Trip Advisor. I took breakfast twice in the same place, chose one restaurant for lunch and one place for pizza. Letting aside the sights in Nerja and the things you should do when/if you get there I will only focus on eating in today’s post, trying to make my article short. So keeping that in mind I took my breakfast at Albi, ate lunch at El Pulguilla and ended the evening with a pizza at Little Italy. While I did have amazing eating experiences in Seville and Ronda food in Nerja left a bitter taste in my mouth. I think I enjoyed it less than my experience in Cordoba but while I think that Cordoba offers some good places to eat I am not so sure about Nerja. The reason for this is simple. Nerja is touristier than Cordoba. I’m not saying that it attracts as much tourists as Cordoba does but I think that the profile of tourists is different. While Cordoba retains many traditions and traditional places Nerja caters more to people with different expectations. I will start off with my experience at Albi’s, the first place where I grabbed breakfast the morning I reached Nerja from Granada. 275 reviews on Trip Advisor. 162 of 323 restaurants in Nerja. Here I will keep things simple. I only ate breakfast two times. No fancy meals, no special courses just a simple breakfast. Churros and chocolate with milk. But I have to be honest. The best churros I ate during my trip in Andalucia. Either eat them and after drink your chocolate or dunk them inside and bite from them I am sure you will love them. Both times I took breakfast I chose a small table on the terrace close to the edge of the terrace, looking at the Balcon de Europa. And I can tell you it is one great way to start a day. 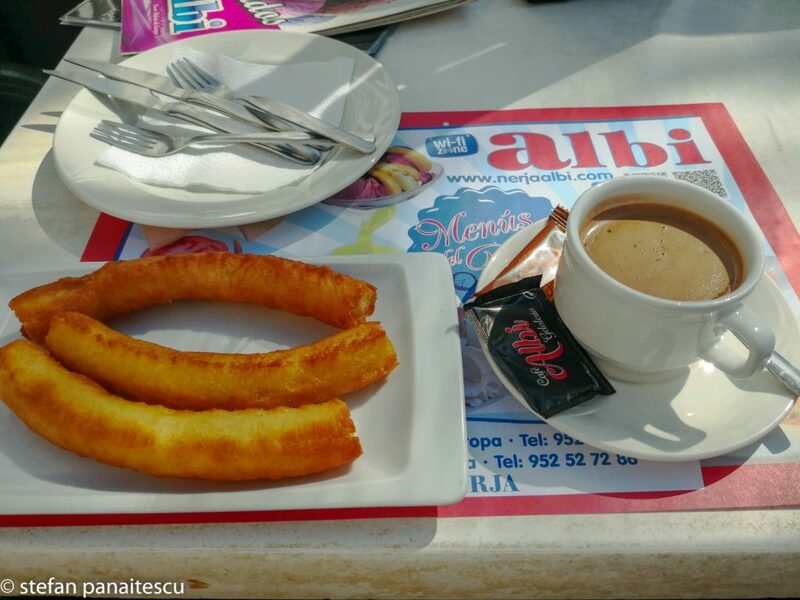 The churros are great, the chocolate hot, the sun shines and lets you enjoy its warmth as you relax. After you finish you can lazily walk for 50 meters and sit on top of Balcon de Europa, ready to take pictures or climb the stairs and in less than 50 meters hit the beach to enjoy the sun. I can’t vouch for the food but if you ever visit Nerja 5 euro for a great breakfast is not that much. El Pulguilla. 1781 reviews on Trip Advisor. 81 of 313 restaurants in Nerja. This is a big place. Really big. Huge interior and a large terrace. I usually don’t eat in places like this one but since it had so many good reviews online I said I could give it a try. First I think this place is expensive. Second I did not like their vegetables, I did not enjoy the use of ketchup, the cooked shrimps that had no taste, etc. I asked for tinto verano having in mind the amazing drinks I had in Seville but ended up with a thing that was just colored and that’s it. Most of the places I enjoyed in Andalucia had local flavor, local products. Even if you asked for a plate of tomatoes or for something simple like some potatoes there was taste in it. Delicious taste. Here it was different. The tomatoes seemed bought from a supermarket and the ketchup on top of the fries was just terrible. I spent 17.40 euro for a dish of shrimps, some tomatoes, potatoes and a glass of tinto verano. While it may seem a decent price I must warn you that in all my places in Andalucia like Seville, Ronda, Granada and Cadiz I had amazing meals with less money. I did receive a complimentary shot at the end of the meal but that didn’t change my mind at all. Many of you might read this and say “but you did not tested fish or something else” but you have to understand that a good restaurant does everything good. 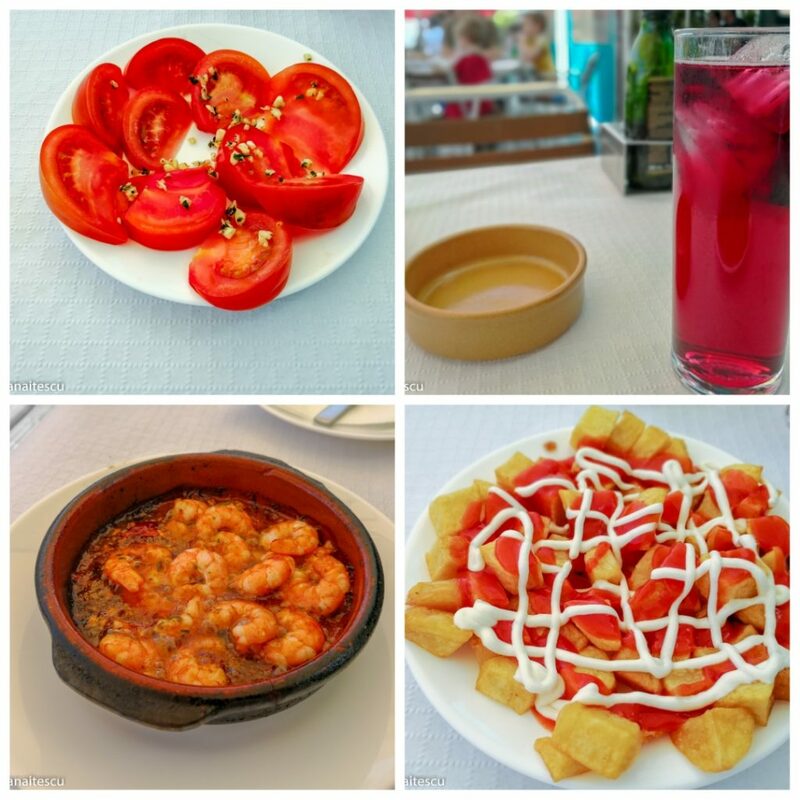 The tomatoes were bad, the ketchup was…well, ketchup, the tinto verano was awful and the shrimps had no taste. It was just bland. Nothing, I mean really nothing, stood up. A single dish. So I am sorry but regardless of how many OK reviews this place has for me it’s a no go. Little Italy. 1393 reviews on Trip Advisor. 105 of 310 restaurants in Nerja. I saved the worst for last. What was meant to be a simple pizza before going to my room turn into a never ending story. Never in my life had I waited 55 minutes for a simple pizza. One beer brought after 15 minutes and waiting an eternity for a pizza. 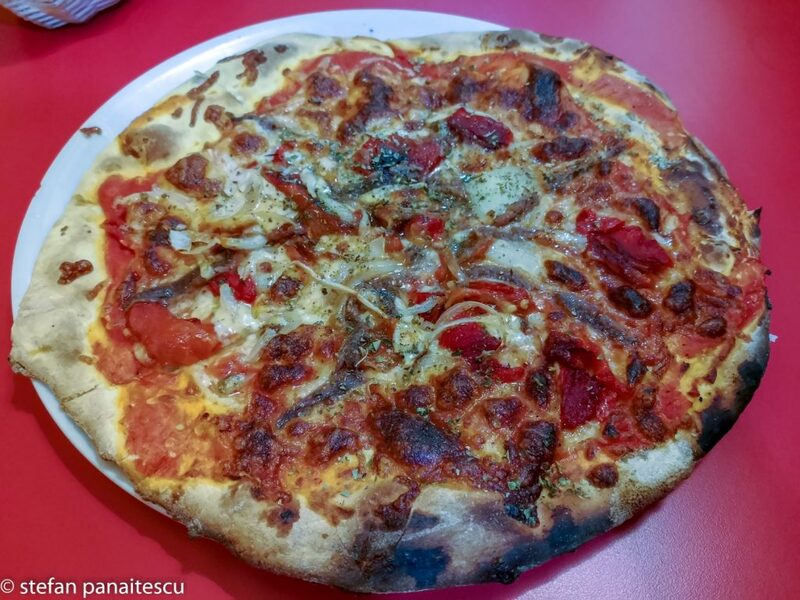 An ordinary pizza. The place was busy but not as busy as to have lines outside waiting. Yes, the staff apologized but that meant little to me. The pizza was decent. Let’s say decent. Because even if it has 4 stars out of 1393 reviews I honestly tell you that this pizza has nothing in common with Italian pizza. The only good thing is that the weather was good and I stretched and watched the people pass on the street. Now, I understand that for 5 euro for a pizza and a beer you can’t really expect miracles but I looked around and everybody had delays in their orders. So yes, the restaurant may seem busy when looking from outside but I guess that’s a side effect when having to wait 30-40 minutes for getting a pizza. To put it bluntly. Don’t eat here. It is just a waste of time and the pizza is not that great. Only two articles left in my Andalucia Series. One for my favorite restaurant in Malaga and one big article for my entire trip. If you liked my Milan article you will love this for sure.